Baptisms are celebrated once a month on a scheduled Saturday. Baptism Preparation Sessions are held once a month on a scheduled Saturday. Parents & Godparents are required to attend the Baptism Prep Session. Please contact the parish office at 949-249-4091 or email info@st-timsrc.org for information regarding Baptism. You may also download the Baptism Registration Form and email or drop off at the Parish Office. 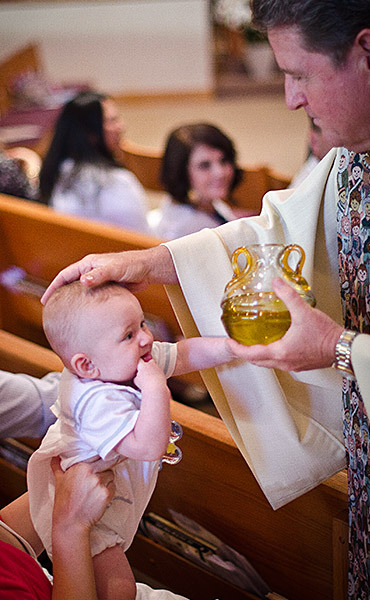 When selecting Godparents for your child, please remember that the godparents provide a witness to faith for the child. 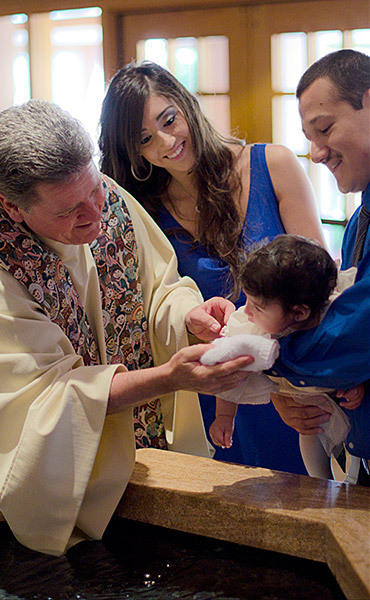 Godparents must be baptized and confirmed, practicing Catholics over the age of 16. If married, the godparents must be married according to the precepts of the church. Each child must have at least one Catholic godparent. They may also have a second godparent, or Christian Witness, who is a member of another Christian church who has received valid baptism and is actively practicing Christian faith. A child can have only one male and one female as godparent/Christian witness. Child in this age group who have not yet been baptized must attend a special program entitled “Rite of Christian Initiation for Children”. It is a longer process that includes classroom instruction for the child and adult instruction for parents and godparents. Please call the office of Faith Formation for more information (949)495-4126. Please contact the parish office at (949) 249-4091 or email info@st-timsrc.org.